When my young friend came to pick me up last Thursday for our visit to the oncologist in Reading she remarked how grey and haggard I looked! Not surprising as I fully expected to be undergoing either chemotherapy or radiotherapy. It was impossible to tell from the oncologist's face what the verdict was going to be. He had the results from the surgeon and Royal Brompton hospital in London. Very rarely does the oncologist recommend a repeat thoracotomy and lobectomy - certainly not for someone of my age. But he did, and the operation was extremely successful and all the medical tests were positive. I was surprised, however, when he told me that a piece of my lung measuring about 6 by 6 by 4 inches had been removed, But his final words were the most encouraging. "You have recovered remarkably well and I recommend you need no more treatment." Yippee! We drove home happily, and the first thing I did when we got there was to start booking a Far East holiday. Yesterday evening my niece, Louisa, and Guy, invited us over to their home in Marlow together with Val for a barbecue. Now that was a delicious meal. And as I don't like garlic (everyone else does) all the food was garlic-free. I especially loved the minted lamb burgers. Little Kate looked very pretty in her new dress. And here she is in pensive mood. 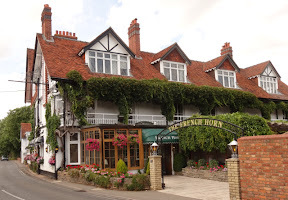 Many moons ago I served a five-year apprenticeship as a lithographic artist at Huntley and Palmers in Reading where I designed biscuit tins and tea caddies. Last year a man called Robert Opie contacted me and invited me to visit his wonderful Museum of Brands in London. In this fantastic world, packaging, promotion, graphic design are all gathered in one place to showcase hundreds of thousands, if not millions, of packages of every description. Robert wanted me to talk about biscuit tins but as soon as I saw the products on display I was soon transported into the past. A truly comprehensive DVD video arrived on my doorstep over the weekend where I discovered my contribution featured not biscuit tins but rambling on about the oval cigarettes in the pink packets that we youths occasionally smoked when we could afford them. The brand was "Passing Cloud". 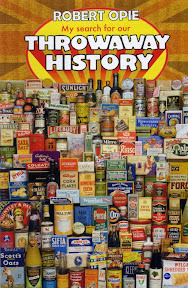 Have a look at their website - museumofbrands.com - well worth it and the DVD is amazing. I'm currently working on a watercolour of David Barber, the Queen's Swanmarker. This one will feature David sitting at the stern of his skiff under a very large flag showing a crown to represent the Queen - as his crew speeds him along the river. I'll publish it here when it's finished (and when - if - he approves it). My young friend is now ensconced in her new house. Most of the weekend was spent helping her with unpacking and do-it-yourself jobs. I'm not very good at this sort of thing but at least I had a go at topiary when I trimmed a couple of box hedges and mowed her lawn. 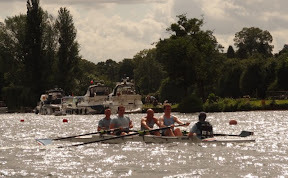 Saturday heralded Henley's Town and Visitors Regatta. 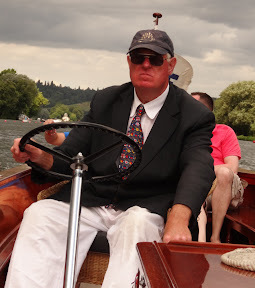 I really like this event as it truly is our own local regatta. 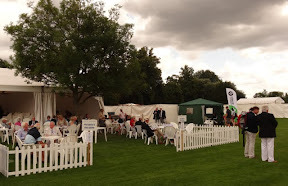 As I'm a subscriber we were able to have a drink - Pimms of course - in the Presidents tent - where we met a number of friends. Later we had a trip on one of the umpire launches. The fours we were following were not brilliant oarsmen. Here are the two crews with the church in the background. And this is the crew that 'caught a crab' just before the finish line. This photograph was taken a few minutes before the incident. 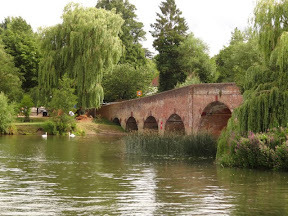 Sonning is a beautiful riverside village. 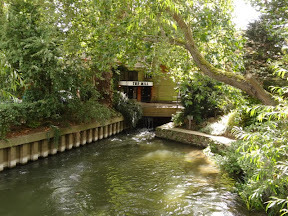 My favourite restaurant - The French Horn - nestles right next to the Thames. We didn't eat there on Sunday afternoon. 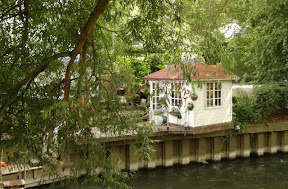 Instead had a little walk along the towpath, starting by Sonning Bridge. 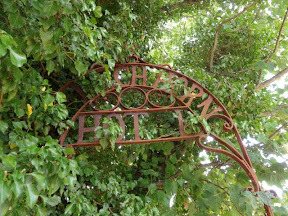 This old metal sign was hidden amongst the branches by the path. 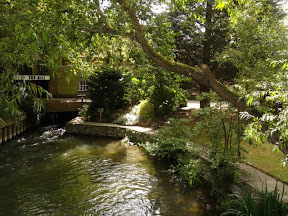 And further on a couple of views of the greenery surrounding the mill as we finished our walk. Now to get back to booking that holiday.